The target area has rocks with mineral veins, and others with concretions (small spherical concentrations of minerals) and grains ranging in size from very, very fine to larger than sand. It provides strong evidence for water and piques the interest of the researchers, who say the variety of materials will help paint a picture of the ancient environment on Mars. Still, the researchers made clear that these findings are preliminary. There is a lot of research to be done, and the drilling Curiosity will do is merely another step in the process of revealing the story of Mars. The upcoming drilling isn't the only first to mention: Last week, Curiosity used its dust removal tool for the first time to brush off a rock called Ekwir_1. Dusting rocks lets some of Curiosity's instruments get a good look at them, allowing for observation that dust would otherwise obscure. The Curiosity rover, which remains healthy, touched down on Mars on August 6, 2012. Want to catch up on the latest Martian news? Check out our archive. One more thing. I believe that there are lots of travel insurance web sites of reliable companies that allow you to enter your vacation details and find you the prices. You can also purchase the international travel insurance policy on the web by using your credit card. All you have to do would be to enter the travel details and you can begin to see the plans side-by-side. Simply find the package that suits your allowance and needs after which use your bank credit card to buy them. Travel insurance online is a good way to search for a respected company regarding international holiday insurance. Thanks for giving your ideas. Dear god you can't be serious. #1 Earth's atmosphere does NOT extend for "100,000 miles". The moon is roughly 400,000km, or 200k miles away. In other words, you are saying that the earth's atmosphere extends halfway between the earth and moon. It doesn't. It'd be difficult to claim earth's atmosphere extends even 1000 km away, that's only about 600 miles. #2 Russia ITSELF was tracking Apollo 11 (and later missions) back then. If we didn't land on the moon, Russia probably is in on the conspiricy too. But I mean what more than 'there are actually retroreflectors on the moon, retroreflectors that you can actually, with a rather simple laser setup, use to confirm we landed on the moon yourself! Hell, we have high resolution photos from lunar orbiters that have the damn landing sites. The kind of massive, half-century long perpetuated giant conspiricy cover-up required to argue 'we didn't land on the moon' is beyond absurd. Boy that picture looks like a bottom of a dried up lake bed, or river bed..I wounder what they would find if they drilled down into the soil right there, and not the rock,...would a small flow of water come up?? ?, .. and then evaporate in the vacuum on Mars?? Hey, Mars looks kinda like Arizona.... NASA wouldn't fake the Mars landing like they faked the moon would they?? arizona is the state where a US Senator chose a certain FAKE from Alaska to run for the White House with him. nothing can be more FAKE than that pair of dummies! Has anyone read these? Amazon.com suggested these. The exerpts read pretty good. Both under $4.00. Now that we have irrefutable proof that water exists on Mars, how much should we spend on getting it to the surface? Check out the story about Michell Obama's style. Now that's news. Why is this even news? We all know that Curiosity will be drilling into the Martian soil. Couldn't CNN wait until AFTER the rover drilled and then report on what was discovered? Or, you can hold off reading it until after it is drilled. This is news because Curiosity is a marvel of modern science and engineering. Everything it does is a milestone and a tribute to what humankind can do with education and tenacity. I'm sorry you don't see that. It was reported that China is willing to trade their claim to the Pacific Ocean for 50% of Mars. I think we should take it because I heard they have a map showing they were there first. You better check Chinese passports, they probably already have a map of Mars there.. If you look at the picture, would you see that water has been on mars 2 billion years ago or few years ago? I think that what you see is not caused by water. From time to time, the temperature drops at some areas of mars to a value which is enough to turn the atmosphere into liquid. The liquid stays on the soil for some time making a river then it dries out when temperature returns back to normal leaving what you see in the picture. You should apply to be the mission's lead scientist, since you seem to know more than all of NASA's scientists put together. Actually Sam makes sense. Mars is reported to have a fair amount of wind. Visually that image appears to have had much more recent liquid flow than millions of years or even hundreds of years. Well, seeing as the atmosphere is 95% CO2 and that Co2 has no liquid state at pressures below 5.1 standard atmospheres, you might need to come up with a better hypothesis. Thanks for your answer, but mars atmosphere contains also a fair amount of nitrogen and other chemicals including even water vapor. Also, what we see in the picture could not be a product of one cycle of temperature drop followed with temperature rise. It could be a product of millions or billions of those cycles. I guess it's too difficult for you to look up the properties of gases and the low temperatures experienced on the region of Mars in question, huh? Or maybe you took the trouble to do that, and found out your theory doesn't hold liquid. Mars atmosphere: 0.6% of Earth's average pressure at sea level and only 3.0 % percent nitrogen – at less than one percent of Earth's atmospheric pressure that is NOT a lot of nitrogen!! It's 95% percent carbon dioxide. Thanks Mathew. As you must know, everything which gets colder gets heavier and moves to the bottom. So, at extremely cold temperatures we can expect the layer of the atmosphere which is in contact with the soil to be dense even if the average atmospheric pressure was low. Also, any material which turns into liquid should move all the way down and become directly in contact with the soil. This is a waste of money right now.When and if things get better ok...but not now. Your profound ignorance and willingness to yield our scientific lead to the rest of the world until "things get better" is the problem. So we can't afford a few billion for a space program but it's OK to give oil companies billions in subsidies? Money spent on the space program have lead to plentiful innovations in other areas, as well as our scientific understanding of who we are. Only a profoundly ignorant person would think this is not well worth our efforts. You are a disgrace. I totally agree with you. I believe our space program is the single most important think that the human race is doing. Joe, absolutely right. Couldn't have said it better. As much as I LOVE science and exploration, I do find some of these comments offensive, especially among "enlightened" people. You are BOTH right. Science is important but not when we ignore these other problems. And Science itself CAN be a problem when the benefits are directed toward an inappropriate end. We all witnessed what happened when RONALD REAGAN had the last say on whether or not the Challenger would fly, all because he had based his State of the Union speech upon our Great Achievement! Like it or not Science does not happen in a vacuum, and we must listen to the voices who ask WHY as much as those who ask HOW. Keep in mind, none of the money for Curiosity is spent anywhere else but on Earth. The vast majority of which is spent in the USA. Such exploration always improves our science and technology, and results in long-term benefits to the US economy. Not to mention the simple, and very important, advancement in our knowledge. And don't forget, the entire budget for NASA is less than 1% of total federal spending. While I agree with the statement that money in the space program is well spent money.... you may want to research how ( and who ) built the Curiosity rover. Turns out most of its on board instrumentation, its rock laser cutting lenses, its high definition cameras... well all outsourced to other countries including France, Spain, Finland, Canada, Russia and Germany. I wouldn't dare say it was "mostly" money spent on American companies. Also, not all money to build the rover came from America. The Russians funded the onboard instrument called DAN ( Dynamic Albedo of Neutrons ), which is a critical element of the rover, because it is the instrument that detects hydrogen or ice water. A response consistent with your screen name minus the digit. I LOVE that photograph. It's the kind that makes geologists absolutely drool. A note for hal9thou: Greetings to you sir. It was rather unfortunate that the discovery to which you refer was mistakely hyped as much as it was. Many of us wish that had not happened but it's just one of thosse things. The discovery was actually some thing we had already seen from previous missions i.e. Viking, Pathfinder, etc. It was merely the rediscovery of simple organic compounds. It seems our society, for whatever reason, is hooked somewhat on instant gratification and so a lot of folks are somewhat disappointed that there have not been more dramatic findings so far. However, this mission is fairly long term and the really interesting parts are not coming up for a little while yet. Curiosity is a very sophisicated device and the chances are excellent that we may find out more about Mars with it than we have on all the other missions combined. 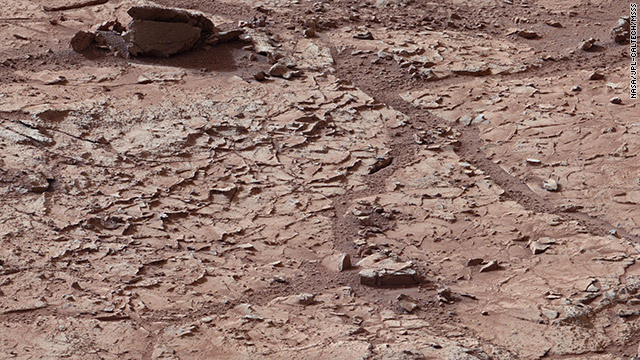 The Earth shattering finding was they found carbon chemistry on Mars- and it has the distinctive signature of life. However, they can't rule out Earth contamination at this point and they have really tried to downplay it (under orders from the aliens). Can anyone image what would happen if they drilled down a bit and struck oil. BP and EXON would suddenly be building spaceships. you could say that BP and Exon would really be strung out. You can bet they would!.. That's the great thing about free enterprise... by their chasing after the opportunity to make a buck, in five years you could be hopping flights to Mars as easy as you can get on a flight to Chicago! Five Years? We can't even put people on the Moon anymore. You must be watching too many cartoons! So... what was that EARTH SHATTERING find from months ago that was supposed to be reported? Guess they thought twice. Someone must have gotten to the announcer. I heard the same thing, then it disappeared. I don't even know who planned to tell us whatever it was. Life on Mars it must have been. I've been wondering the same thing. I've email them several times but no reply. Something smells fishy to me. I think they've found evidence of previous life but were told not to make it public. They found methane (i think that was it) in the atmosphere and some of the sand they were testing. Most the methane on earth comes from organic material, although not all. So the find was that there is stronger evidence to support the idea that mars does or has in the past had life on it. It didn't get as much attention because it was a slightly stronger evidence for life and not the 'we found life' that everyone was expecting. Science takes time. So it's not always suited to the media. Things have to be checked, argued over, checked again, re-tested, criticisms addressed, etc. Sure, it would be great to scoop up and say, aha! Water! Life! That's not how it works, unless the water is gushing out of every crack. We already know that that's not the case, and they're trying to find out if there was once water in the last million or billion years. How hard is that? Think about it.